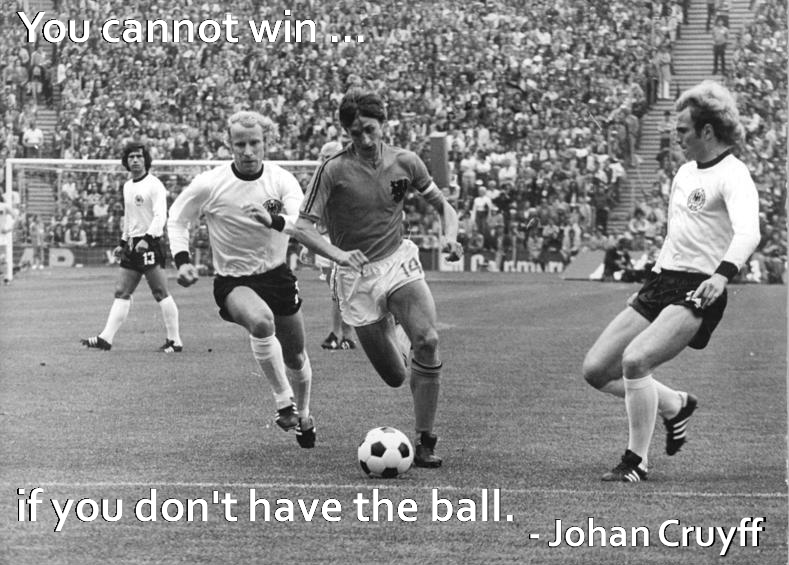 Nothing bad can happen when you possess the ball. This is the foundation to Tommy Howe’s coaching philosophy, and Sporting St. Louis’s approach to the game. Throughout history, the great teams, the artists – Barcelona, Spain, Brazil and Holland, Ajax – have emphasized possession as the fundamental driver of success on the field. At the younger ages, too many clubs and too many coaches play to win, cashing in on raw athleticism and short-changing long-term development and technical ability. At Sporting we train to maintain possession in small, tight spaces, to work the ball out from the back, to master soccer’s most hard-won skill, movement off of the ball. Posession is 9/10ths of the Game. Training sessions at all ages focus on maintaining and winning possession. It is the fundamental building block upon which all else is built. It is not enough to pass the ball to a teammate. The ball must arrive at the right time and to the right foot. It is not enough to settle the ball; a player must be able to settle the ball with the laces, with the inside of the foot, and with the outside of the foot. Players must master a high level of technical ability in order to play the style Sporting St. Louis requires. Many coaches abandon skills training at older ages; we emphasize technical skills as an integral part of a player’s development and a continuing part of training at every age. Tommy Howe has never just rolled the balls out for a practice in his life. Every practice has been prepared, every drill has meaning, and a week’s worth of practices build on a theme that leads to a larger movement within the game. Practice has a purpose. Drills are toward a goal, mastering one of the elements of the game. That actions have purpose is also reflected on the pitch during the game, itself. Movement, possession, passes … they are with purpose, toward goal, attacking. This is the game as we see it, the game at its most beautiful. It is an approach to the game that takes years to master. In the United States, most clubs don’t have the patience for it. Many high school and college coaches are afraid to play our style, concentrating on negative football, parking the bus in front of the goal. It is why so many of the players developed in the US are not very technical – as a country we keep emphasizing athleticism over technique. But US soccer doesn’t need more athletes – it needs mores soccer players. It’s our intent to develop soccer players.